1. Heat the oil in a frying pan and fry the egg fried rice, peas and almonds for 2-3 minutes. Stir in the coriander and 1 tbsp chilli sauce. 2. Meanwhile, brush the tuna with a little oil and griddle for 1-2 minutes each side, or according to taste. 2. 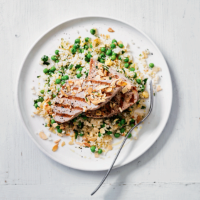 Serve the tuna with the rice and drizzle with the remaining chilli sauce.